Disclaimer: Please do your research before embarking on any type of DIY projects. Including those that have been posted here. The blogger will not be held responsible for any mishap, injury and/or material damage that might happen. The intention of the blogger is not to teach but to share these projects. Before embarking on my very own DIY CO2, I did some research to better understand the building of this system. My main confusion was the need for the check valve. Nonetheless, the construction and mixture was pretty straight forward and many have done it with much success. I would also like you to refer to Robert's and Stanley's Blog. The links are on the side. They did a marvelous job on their DIY projects. A job well done guys. I was not getting enough BPS (Bubble Per Second) with one bottle CO2 and had tried a construction similiar to Robert's but I was not getting much success. Hence, I came up with my own. Here's my version. If you have comments on the construction, please comment. I would love to hear from you. Using a bubble counter of any kind at least for me does not matter. The bigger the tube, the slower the bps; smaller it is, the faster the bps. You're better off having a Drop Checker to check that your tank is receiving enough CO2. Try not to use the Atomizer for this. It requires a higher pressure. 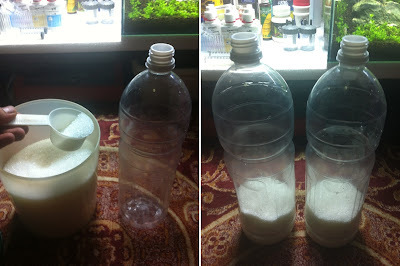 It did work on my first DIY CO2 but the bottle went bloated. The recommended is 1/4 Teaspoon of Yeast but here I added more to produce slightly more CO2. This is how it will be set up. 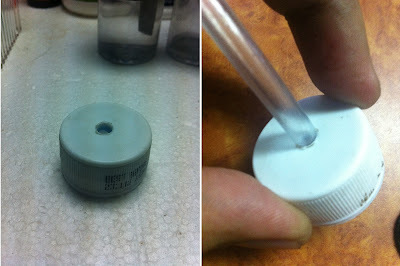 Cut the CO2 tubing at an angle and insert into hole. Using a plier pull the tubing. Drill three holes on the cap. For the third tube, cut the excess and level it to that of the bottle cap. 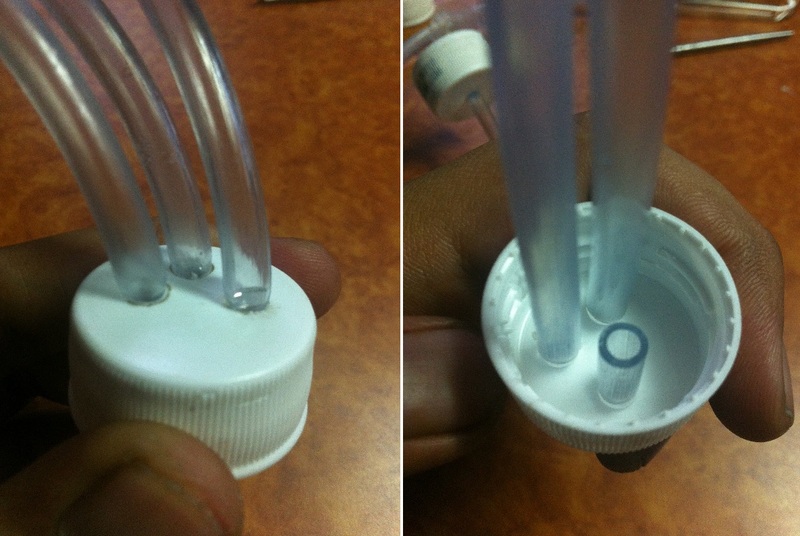 You can add the water into the 0.5l bottle now. Measure the amount of CO2 tubing that you need. Install the check valve and diffuser accordingly. 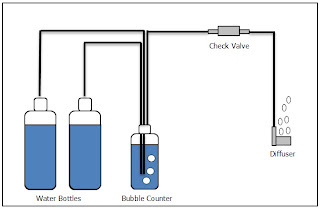 I don't see the need to use a bubble counter (LFS kind of Bubble Counter) but as I would like to record the progress for this DIY, I will be adding one more Bubble Counter (From LFS) between the diffuser and the check valve. 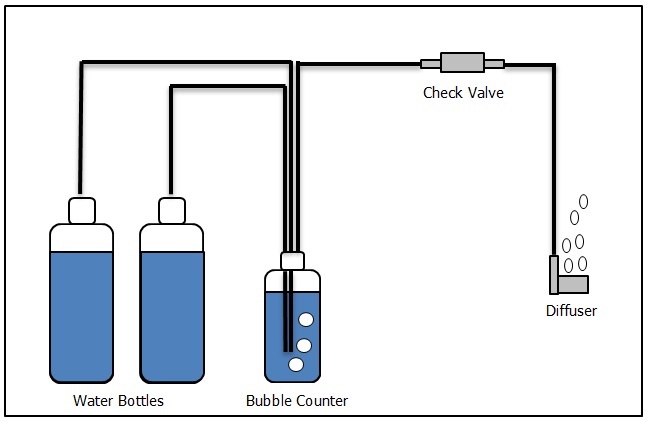 Please comment if a check valve between the bottle (mixture) and the 0.5l bottle (bubble counter/seperator) is necessary and whether it will help should you prefer changing one bottle without having to remove the entire construction. 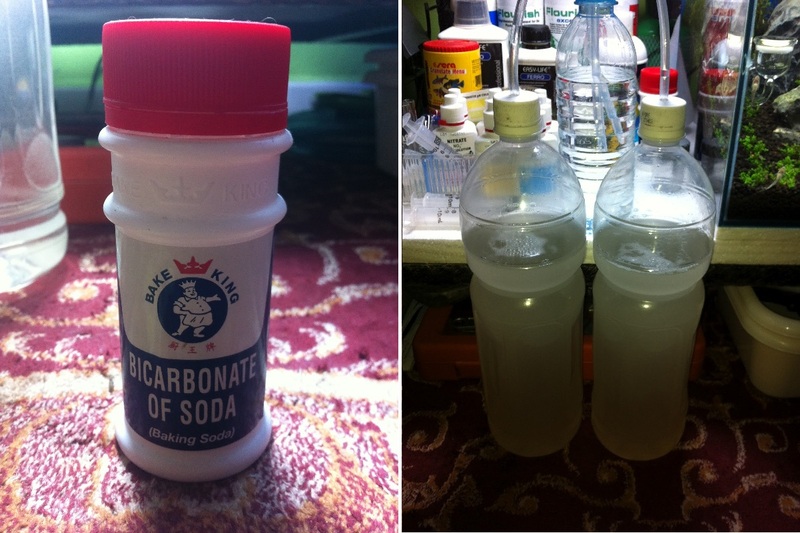 Add sugar into each bottle. Add just a bit of hot water and fill 3/4 of the bottle with warm water. Place cap and shake it till sugar dissolves. Wait till the bottle cools. Do not pour the yeast if the water is hot. Add the yeast and bicarbonate of soda. Now you're more or less set. Tighten the cap on all three bottles. All you have to do now is wait. It takes about 12 hours or so to see the bubbles in your bubble counter/seperator. Once you see bubbles coming from your diffuser, start checking for leaks. If you have notice, I did not use any glue of any kind for this construction. The reason is, the hole I made is smaller than the tube. Hence, when I pull the tube through the hole, it creates a seal. Check done around the hole shows no leaks. Anyway, to those who wish to go down this road, good luck! It's not as difficult as it may sound. 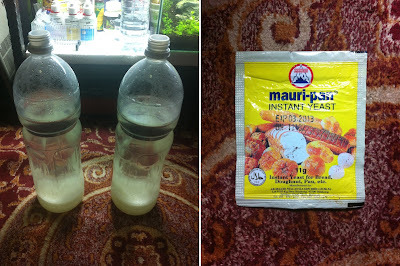 Just note, the more yeast you put in, the more CO2 but it will run out much faster. I'm looking at a 3 weeks usage minimum. 4 weeks will be the goal. How Many days of co2 can your design give u? I've not blog for so long. Can't believe people are still reading it. Haha As to your question, I'm sorry. I forgot. Been way too long Just a few days perhaps. I would recommend it only as a temporary measure if you run out of CO2 from your CO2 tank and forgot to refill it.